Home > New Treatments > What is an Aortic Dissection? It is fairly rare to have an aortic dissection; only one person in 100 000 people in the UK population will be diagnosed with one each year, but it is still the most common medical emergency that is due to a problem with the aorta. Aortic dissection occurs rarely in young people; it is most commonly seen in middle aged men, with those aged in their 60s being most at risk. This is the major artery that carries blood out of the heart and to the tissues of the body. It leaves the left ventricle, the most powerful muscular pumping chamber of the heart and first of all travels upwards in the direction of the neck; this part is called the ascending aorta. It then forms an arch, the aortic arch, before travelling down through the chest to the top of the abdomen. The portion of the artery is called the descending aorta. An aortic aneurysm and an aortic dissection can affect any part of the aorta, but the symptoms can vary depending the precise location of the problem. 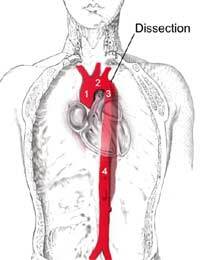 If the wall of the aorta because weak, which it can do because of atherosclerosis, this can lead to an aneurysm. The blood in the aorta is under high pressure and this causes the weakened wall to balloon outwards, causing a large bulge in the artery. This can cause pain or it can produce no symptoms at all. If an aneurysm ruptures, blood pressure falls and this can be fatal. The other thing that can happen is that the wall of the aorta splits. If you imagine that the wall is made up from thin layers, a little like a hollow leek, it is easy to see how blood can get through a tear in the innermost layers, and get in between the inner layer and the outer layer. This dissects or separates the wall, forming a separate compartment that is then full of blood. This blood can’t get anywhere, it travels up, causing the internal tear to lengthen but then the blood loses momentum and starts to clot. This then makes it more likely that the artery wall will rupture but an aortic dissection is in itself a medical emergency. What Symptoms does an Aortic Dissection Cause? Typically, an aortic dissection is a sudden event. The wall of the aorta tears and a significant amount of blood flows into the space within the tear. This causes an intense pain that is either felt in the chest or in the back and has been described by those who have experienced it as a ‘tearing pain’. The person affected will feel very unwell and may collapse because their blood pressure falls and their pulse can actually stop for a time. If the aortic dissection is severe and medical aid cannot get to the person quickly enough, the aorta can then rupture. This causes a massive release of blood into the chest cavity, where it affects the lungs, or into the space around the heart, causing cardiac tamponade, a build up of blood inside the pericardium, the membrane that surrounds the heart. The routine tests for someone with possible signs of an aortic dissection include an electrocardiogram, a chest X ray, a CT scan and an MRI scan. An aortic dissection will only show up well on an MRI scan and this is the best tool to diagnose the condition and to visualise the extent of the tear in the aorta. The symptoms are quite similar to other heart conditions, such as a heart attack, and a heart attack can precede and follow an aortic dissection. An aortic dissection and subsequent rupture can lead to death that occurs very suddenly, so prompt treatment is very important. Some type of surgical repair is usually required; this can either be done as open surgery, involving a heart and lung machine, or endovascular surgery. These are both specialised procedures that need to be performed by an expert cardiologist and both methods of aortic repair involve significant risk of stroke and death. If the operation goes well, however, the aortic dissection can be repaired using a stent and tissue grafts. Emergency treatment as surgery is being arranged needs to be done to make sure that the blood pressure of the person affected does not rise to dangerous levels. People with an aortic dissection are invariably treated in an intensive care unit, and recovery from a successful repair operation can take several months.